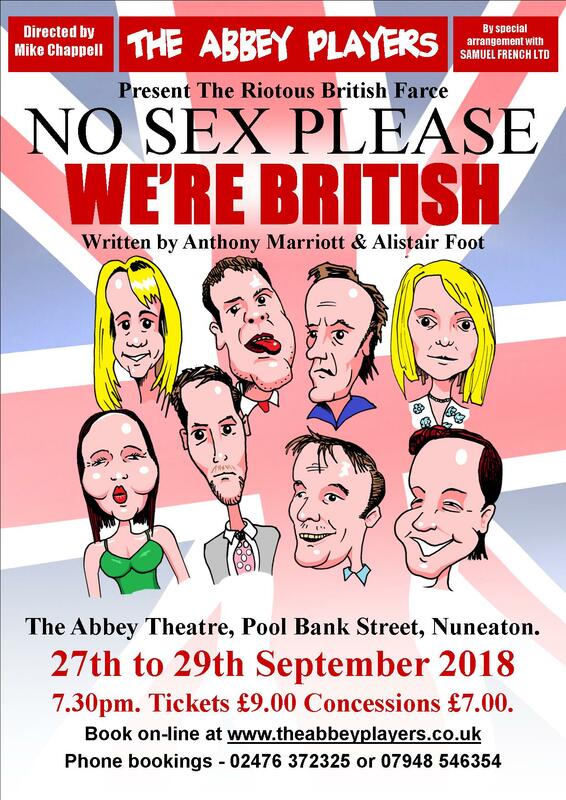 Having entertained audiences in the Midlands for over thirty years with their pantomimes, variety shows, and award winning one-act plays the Abbey Players have now extended their annual schedule and for the second year bring a full length play to the stage. First performed at the Thorndike, Leatherhead on the 8th May 1990 "Out Of Order" was subsequently produced at the Shaftsbury Theatre, London and went on to win London’s Lawrence Olivier Award for “Comedy of the Year". Richard Willey MP is meeting Jane Worthington (the personal assistant of the Opposition Leader) in the room of his Westminster hotel. A problem arises in the shape of a dead body stuck in the window of their suite. As Richard shouldn’t be with the young lady in the first place he can’t report the body to either the hotel management or the police so (foolish fellow) he enlists the aid of George Pigden. In the time honoured tradition of bawdy "Carry On" style comedy and seaside humour this is British farce at its very best!